Awesome laser pics - 40mW 638nm pics added! 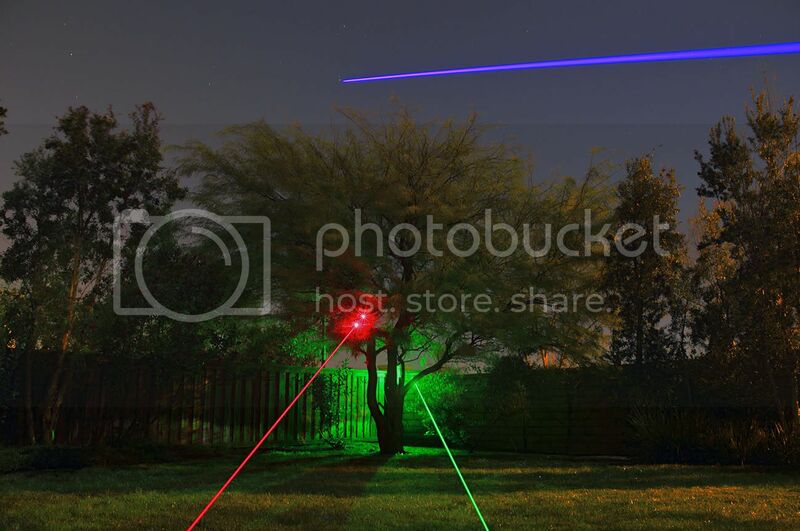 Re: Awesome laser pics - HDR pics added! Very nice! I'm still having trouble getting good shots using my D90. I think I need some better glass. What program do you use to make your HDR's? I tried photomatix but it can never seen to align them properly. Thanks. I'm glad you like 'em. I'm still learning as well. I hear good things about the D90. I use Photoshop CS3. I haven't tried Photomatix, but since I am pretty comfortable with PS I don't think I'll need to buy more software just yet. I use a tripod for the HDRs. It makes the process much simpler. My next investment will be a better tripod and a remote shutter release. The tripod I have is a cheap plasticy POS. EDIT: Another new HDR pic! I understand the basics of HDR but I have never actually tried doing it myself. How many exposures were you taking for each of the pictures and how do you combine them together to create the final HDR picture? I first touch up the raw images in my raw editor (Digital Photo Professional) then convert them to 16 bit TIFF. Then I use the "Merge to HDR" feature in Photoshop and select the bracketed exposures. After that I post process in Photoshop. It's a time consuming process and not all of the HDRs I've tried turned out well but it is fun to play with. My composition is still lacking, so I still have some practice to do before I produce something I am really proud of, but I don't think it hurts to experiment.